Abstract. Over the past decade, the diminishing Arctic sea ice has impacted the wave field, which depends on the ice-free ocean and wind. This study characterizes the wave climate in the Arctic spanning 1992–2014 from a merged altimeter data set and a wave hindcast that uses CFSR winds and ice concentrations from satellites as input. The model performs well, verified by the altimeters, and is relatively consistent for climate studies. The wave seasonality and extremes are linked to the ice coverage, wind strength, and wind direction, creating distinct features in the wind seas and swells. The altimeters and model show that the reduction of sea ice coverage causes increasing wave heights instead of the wind. However, trends are convoluted by interannual climate oscillations like the North Atlantic Oscillation (NAO) and Pacific Decadal Oscillation. In the Nordic Greenland Sea the NAO influences the decreasing wind speeds and wave heights. Swells are becoming more prevalent and wind-sea steepness is declining. The satellite data show the sea ice minimum occurs later in fall when the wind speeds increase. This creates more favorable conditions for wave development. Therefore we expect the ice freeze-up in fall to be the most critical season in the Arctic and small changes in ice cover, wind speeds, and wave heights can have large impacts to the evolution of the sea ice throughout the year. 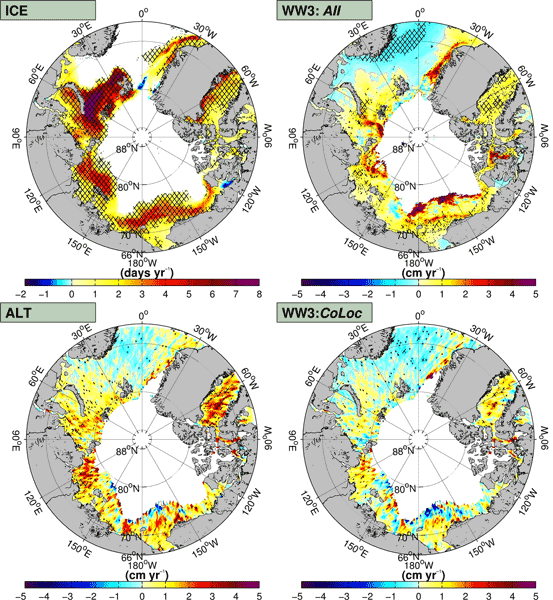 It is inconclusive how important wave–ice processes are within the climate system, but selected events suggest the importance of waves within the marginal ice zone. 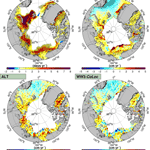 How to cite: Stopa, J. E., Ardhuin, F., and Girard-Ardhuin, F.: Wave climate in the Arctic 1992–2014: seasonality and trends, The Cryosphere, 10, 1605-1629, https://doi.org/10.5194/tc-10-1605-2016, 2016.